7 classes. Each class lasts 1 hour. The Practical English course is for students whose English is very basic or who have studied English years ago. 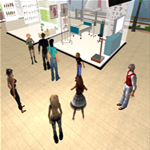 It is designed to give students language skills to deal with everyday situations in SL and rl. The classes use voice. We will practice vocabulary, phrases and pronunciation, role playing, questions and answers. Students will receive a note card with useful vocabulary and phrases at the beginning of each class. A1 level "Can understand and use familiar everyday expressions and very basic phrases aimed at the satisfaction of needs of a concrete type. Can introduce him/herself and others and can ask and answer questions about personal details such as where he/she lives, people he/she knows and things he/she has. Can interact in a simple way provided the other person talks slowly and clearly and is prepared to help." Contact our staff to know when a new one starts. Lesson 3 at the Hotel Reception: booking a room, hotel check in and out. Lesson 4 at the Bank: opening and closing a bank account, depositing, withdrawing and exchanging currency. Lesson 5 at Hospital: arriving at the Hospital or Emergency Room. Lesson 6 at the Garage/Salon: going to car repair and getting a haircut or a hair dye. Lesson 7 at Home: everyday object and actions. This site is hosted by cool creative concepts inc.